Meet two of our all-time favorite black teas complete with everything you need to brew the perfect cup. Inside you'll find an infuser and perfect scoop to boot, just add hot water and you're in black tea heaven. 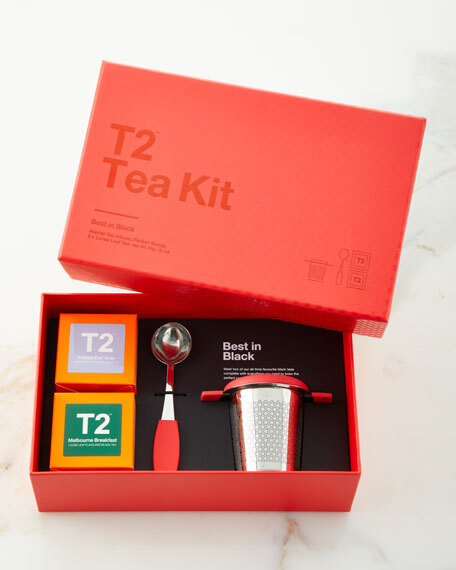 "Best in Black" T2 Tea Kit includes: Merrier Tea Infuser, Perfect Scoop, French Earl Grey Loose Tea, and Melbourne Breakfast Loose Tea. Box: 9.5"W x 6"D x 3"T.
For in-store inquiries, use sku #2768004.